How could something that tastes so good... be so... natural? Garden of Eatin'® was founded almost 35 years ago by Al Jacobson, a visionary who was always several steps ahead of his contemporaries. He first considered the idea of becoming a vegetarian in the early 1900s when as a toddler living on a farm in Pennsylvania, he discovered the family ate his favorite playmate, a chicken! During the 1940s when experienced yoga and metaphysics and became a traveling product demonstrator for Hain Pure Foods, an organic company on the West Coast. In the early 1970s, Al let his spiritual side guide him to start his own health food company which he called Garden of Eatin’® He launched Bible Bread, organic whole wheat pita. Then in 1986, after he followed his natural health instincts and purchased tons of organic blue corn, Al decided to produce Blue Corn Chips. In keeping with his unorthodox approach, the chips were launched at a major fancy foods show and they took off. Since then, Garden of Eatin’® has introduced over 20 varieties of all natural tortilla chips, each of them true to Al’s inspiring outlook on life and healthy snacks. These include healthy chips, healthy alternatives to chips and low calorie snacks. 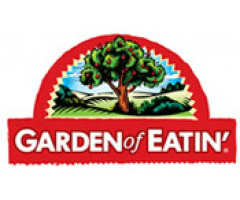 In 1998, Garden of Eatin'® became a part of The Hain Celestial Group, Inc., a natural and organic foods company that’s been providing A Healthy Way of Life™ since 1993. The current range includes: Blue Chips, Red Chips, White Chips, Sesame Blues, Salsa Reds, and Mini Yellow Rounds.